Iran began dismantling centrifuges to comply with its obligations under the July 14 nuclear deal, according to the International Atomic Energy Agency. Iran began dismantling centrifuges to comply with the restrictions on its nuclear program laid out in the July 14 agreement with six countries, the organization charged with overseeing worldwide peaceful nuclear activities reported last month. In its quarterly report on Iran’s nuclear program, the International Atomic Energy Agency (IAEA) said that, between Oct. 18 and the report’s completion on Nov. 18, Iran had dismantled 4,530 centrifuges. Iran’s ambassador to the IAEA, Reza Najafi, told reporters on Nov. 19 that the report demonstrates that Iran’s nuclear activities are peaceful and the country is fulfilling its commitments under the nuclear agreement, formally known as the Joint Comprehensive Plan of Action. The centrifuge dismantlement began after the nuclear agreement between Iran and the six-country group known as the P5+1 (China, France, Germany, Russia, the United Kingdom, and the United States) was formally adopted on Oct. 18. The majority (4,112) of the dismantled machines were first-generation centrifuges at the Natanz enrichment plant, according to the IAEA report. The IAEA also reported that Iran dismantled 160 second-generation IR-2M centrifuges from Natanz and 258 first-generation machines at the Fordow enrichment plant. None of the centrifuges removed from Natanz or Fordow had been enriching uranium, according to the agency. Under the terms of the nuclear deal, Tehran will reduce its total number of installed centrifuges from more than 19,000 to 6,104 first-generation centrifuges, of which 5,060 will enrich uranium to reactor-grade levels at Natanz. The remaining 1,044 machines will be at Fordow, which will be converted to an isotope research center. All of the dismantled machines will be stored at Natanz under IAEA surveillance. Dismantling excess centrifuges is just one of several steps that Iran must complete before the nuclear deal is fully implemented and Tehran receives sanctions relief. Under the terms of the deal, Iran also must remove and disable the core of the partially completed heavy-water reactor at Arak, which would produce up to two weapons’ worth of plutonium per year, and reduce the country’s stockpile of uranium enriched to reactor grade (3.67 percent uranium-235) to 300 kilograms. Under the nuclear deal, Iran will not receive sanctions relief until the IAEA certifies that Tehran has fulfilled its obligations. IAEA Director-General Yukiya Amano is expected to issue a report assessing Iran’s past work allegedly related to nuclear weapons development, known as possible military dimensions, ahead of a Dec. 15 meeting of the agency’s Board of Governors. The IAEA laid out its concerns about this work in an annex to its November 2011 quarterly report. (See ACT, December 2011.) Iran maintains its nuclear program is entirely peaceful. Amano said on Oct. 15 that Iran and the IAEA had completed all activities necessary for the agency to finish its investigation and issue an assessment. 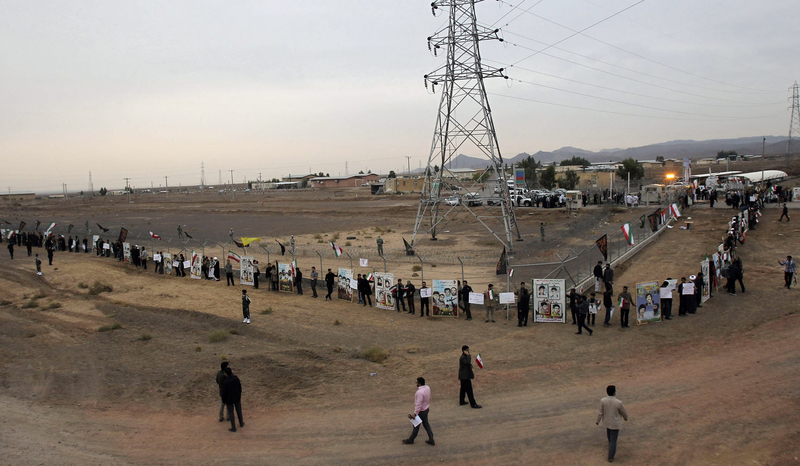 The IAEA’s most recent quarterly report did not indicate any activity at the Arak reactor. The report said Iran’s stockpile of enriched uranium grew by 490 kilograms since the agency’s August report on the Iranian nuclear program. Iran now has 8,305 kilograms of reactor-grade material in gas form and 2,330 kilograms in powder form, the report said. Speaking at the same conference on Nov. 12, Laura Rockwood, former section head for nonproliferation and policymaking at the IAEA Office of Legal Affairs, said she remains “doubtful that the agency will be provided with sufficient substantive information” by Iran to fully resolve the outstanding issues. Although some issues might be resolved, the report will likely not signal “an immediate return to routine safeguards” in Iran, but rather that the IAEA board will have a “continuing interest in oversight” of the agency’s work in Iran, she said. Although Iran has not yet removed the core of the Arak reactor, progress is being made on the redesign plan for the modified reactor, according to Iranian and U.S. officials. Under the July 14 agreement, Iran is required to use a new reactor core that will produce significantly less plutonium than if the reactor were completed as originally designed. 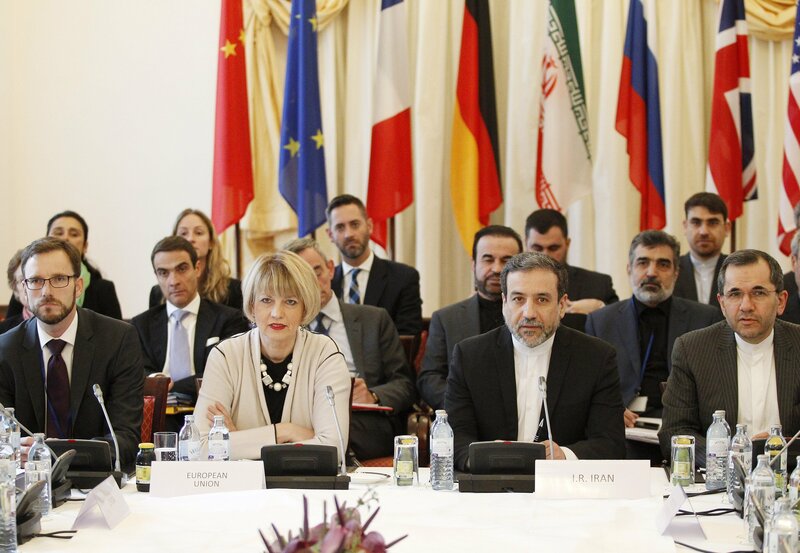 Iranian Deputy Foreign Minister Abbas Araqchi said on Nov. 16 that the plan for the redesign was complete and that Iran and the European Union, which headed the P5+1 negotiating team, had endorsed the document. Iran, China, and the United States worked together on the initial plan for modifying the reactor. Behrouz Kamalvandi, spokesman for the Atomic Energy Organization of Iran, said in early November that four of the P5+1 countries would cooperate to supply Iran with advanced equipment for the reactor and other nuclear facilities and activities under the deal. He did not specify which four countries are involved. China is to work with Iran on the ground to complete the reactor conversion. The UN committee dealing with disarmament issues passed a resolution calling for a Middle Eastern zone free of weapons of mass destruction, but an official from the region said he thinks progress on such a zone is not possible now. The resolution was sent to the General Assembly after it passed the UN First Committee 151-5, with 19 abstentions. Israel called on member states to vote against the resolution and was joined by Canada, Micronesia, Palau, and the United States. The resolution reaffirmed the need for Israel to ratify the NPT and place its nuclear facilities under safeguards. Israel does not publicly acknowledge that it possesses nuclear weapons. In a statement explaining her country’s vote on the resolution Nov. 2, Tamar Rahamimoff-Honig, director of the Arms Control Department for the Israeli Ministry of Foreign Affairs, called the resolution “one-sided and biased,” saying it did not reflect the “harsh and distressing everyday realities” of the region. She said that “any draft resolution attempting to outline the real proliferation threats” in the Middle East should express concern that some countries in the region view compliance with their international obligations as “no more than a recommendation” rather than as a binding commitment. She noted that Iran, Iraq, Libya, and Syria had been found to be violating their NPT obligations. 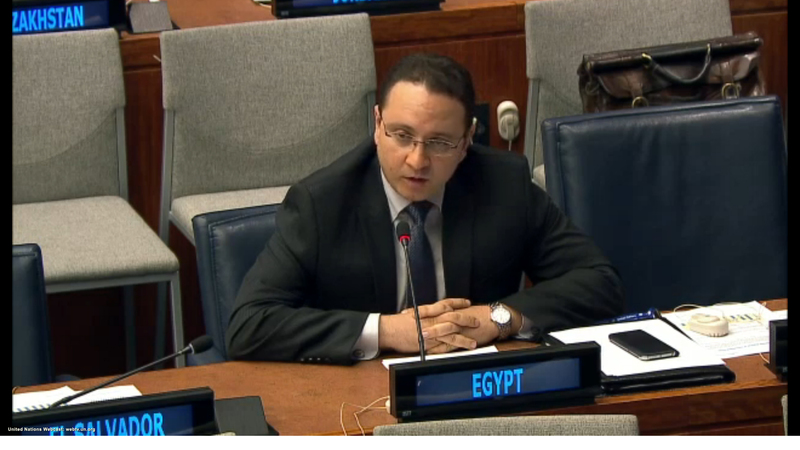 Tarek Mahfouz, speaking on behalf of Egypt and the Arab Group, said in an Oct. 29 statement to the committee that the NPT will lose credibility if there is no progress toward the Middle Eastern WMD-free zone. He called Israel’s refusal to join the treaty a “blatant threat” to peace and security in the region. Despite the overwhelming support for the resolution, an official from a Persian Gulf state said that given the current geopolitical concerns in the region, pursuing a zone based on the 1995 resolution is a “lost cause” at this time. He said that the 2015 NPT Review Conference “killed the small seed of cooperation” and progress on a WMD-free zone conference agenda that Finnish facilitator Jaakko Laajava managed to foster during consultations in 2013 and 2014. During that time, Israel and the Arab League states participated in five rounds of talks in the Swiss city of Glion. At this year’s NPT review conference, Canada, the United Kingdom, and the United States opposed the Arab League’s push to set a deadline for holding the conference and appointing a new special representative. (See ACT, June 2015.) Their opposition derailed the Arab League’s plan, as decisions at NPT review conferences require consensus. In her Nov. 2 statement, Rahamimoff-Honig said that Israel “indicated its willingness to proceed” with the Glion meetings, which were “an important start to a necessary dialogue” to close the “conceptual gap” on the zone. Unless another Arab League state “decides to challenge Egypt” for leadership on this initiative, there will not be progress, the Gulf state official said. He said he doubted that any country in the Arab League was interested in investing the necessary political will to move the zone process forward at this time. He suggested that a subregional approach, in which a smaller group of countries in the region would pursue a WMD-free zone, or a “thematic” approach, such as a chemical-weapon-free zone, might be more successful. In a separate Nov. 2 action, the First Committee passed a resolution on a Middle East nuclear-weapon-free zone without a vote. This resolution focused only on nuclear weapons and did not specifically call on Israel to joint the NPT. It did call on all countries in the region to put their nuclear activities under safeguards, but did not single out Israel. Hossein Dehqani, Iran’s deputy ambassador to the United Nations, said in a Nov. 2 statement that Israel continues to be the “only impediment” to realizing a nuclear-weapon-free zone in the Middle East and called on the international community to “exert all efforts to compel the Israeli regime to verifiably eliminate” its nuclear weapons. In her statement on the nuclear-weapon-free-zone resolution, Rahamimoff-Honig said that, despite “substantive reservations,” Israel joined the consensus supporting the resolution because the Israeli government supports a regional process aimed at establishing a more secure Middle East free from nonconventional weapons. That resolution recognizes “the importance of a credible regional security process” to achieve a WMD-free zone in the Middle East, Rahamimoff-Honig said. The WMD-free-zone resolution did not call for a regional security process. The Iran nuclear deal provides an unprecedented opportunity for progress toward a Middle Eastern nuclear-weapon-free zone over the next decade. The July 14 agreement between Iran and the six-country group known as the P5+1 established a set of important limitations and related transparency measures on Iran’s nuclear activities. Approved unanimously by the UN Security Council on July 20, the agreement, formally known as the Joint Comprehensive Plan of Action, aims “to ensure that Iran’s nuclear program will be exclusively peaceful” and thus to reduce the risk of nuclear proliferation. To this end, it imposes limits for a decade or more on Iran’s use of the key technologies required to make highly enriched uranium (HEU) and to separate plutonium, the fissile materials that are the critical ingredients in nuclear weapons. Other states in the Middle East, especially Egypt and Saudi Arabia, are planning to establish their own nuclear power programs during the period that the Iran deal is expected to be in force. This has led to concerns about how Iran and other countries in the region will act when restrictions on Tehran’s nuclear program end. To address such concerns, this article proposes that the P5+1 and the states of the Middle East use the next decade to agree on region-wide restraints based on the key obligations of the Iran deal as steps toward establishing a Middle Eastern nuclear-weapon-free zone, preferably as part of a regional zone free of all weapons of mass destruction (WMD).1 These measures would ban the separation of plutonium, limit the level of uranium enrichment, place enrichment plants under multinational control, and cap and reduce Israel’s existing stocks of fissile materials available for use in nuclear weapons, in time eliminating its arsenal through a step-by-step process. These are intermediate steps to a nuclear-weapon-free zone that would establish strong, new technical and political barriers to any future attempts by countries in the region to seek a nuclear weapons capability. Although different Middle Eastern states may favor different sequencing of these and other steps, all of the intermediate steps presented below have nonproliferation and disarmament value in their own right. Individually and in groups, states in the region should be encouraged to adopt these steps as way stations toward the larger goal of a nuclear-weapon-free Middle East. They also should be pursued globally as steps toward global nuclear disarmament, especially by the five permanent members of the Security Council (China, France, Russia, the United Kingdom, and the United States), who all have nuclear weapons and with Germany make up the P5+1. As in the Iran deal, verification arrangements will be important. Covert proliferation has a long history in the Middle East, starting with Israel’s nuclear program in the 1960s and continuing with the violations by Iraq, Libya, and Syria of their commitments under the nuclear Nonproliferation Treaty (NPT) and most recently the confrontation over Iran’s nuclear program. Given this history and the deep mutual suspicions of countries in the region, a robust regional safeguards, monitoring, and verification regime may add to the confidence provided by the International Atomic Energy Agency (IAEA) nuclear safeguards system. Most of the states expected to join a Middle Eastern WMD-free zone have signed and ratified the Chemical Weapons Convention (CWC) and the Biological Weapons Convention (BWC), and all but Israel have joined the NPT as non-nuclear-weapon states. Many also have signed and ratified the Comprehensive Test Ban Treaty (CTBT). Some are members of the African nuclear-weapon-free zone, created by the Treaty of Pelindaba, which entered into force in 2009 (table 1). Ban on the separation of plutonium. As part of the nuclear deal, Iran agreed that, for 15 years, it “will not, and does not intend to thereafter” carry out any separation of plutonium from spent nuclear fuel, an operation known as reprocessing. Iran also pledged not to build a facility capable of reprocessing or to carry out any research and development activities in that area. In addition, Tehran affirmed its intent to ship out to another country, presumably Russia, all spent nuclear fuel from all present and future power and research reactors. Israel’s plutonium has been separated from the irradiated uranium in an underground reprocessing plant adjoining the reactor. 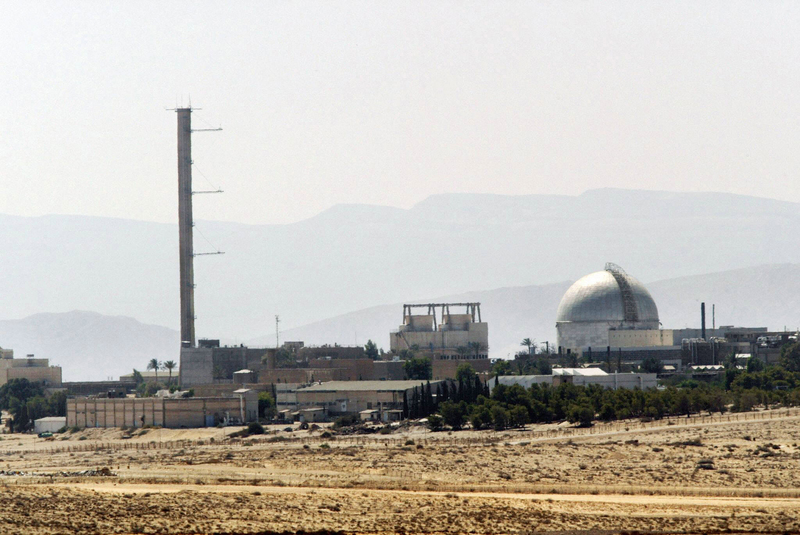 As its first step toward a Middle Eastern nuclear-weapon-free zone, Israel could shut down the Dimona reactor and end reprocessing of the accumulated discharged fuel. These steps could be verified with fair confidence at first without access to the site and later under an arrangement that would give IAEA inspectors what is known as managed access, which would allow them to determine that the facilities were indeed shut down while allowing Israel to protect sensitive facility information. Restrictions on uranium enrichment. Centrifuge enrichment plants pose significant proliferation concerns because they can be quickly reconfigured for HEU production.7 This is why a major part of the nuclear deal focuses on Iran’s gas-centrifuge uranium-enrichment facilities and activities. Iran agreed that it will keep its operating enrichment capacity limited to one site and to a total of 5,060 first-generation centrifuges for 10 years and limit for 15 years the enrichment of its product to less than 3.67 percent uranium-235 and its stock of low-enriched uranium hexafluoride, the gaseous form that could be fed into the centrifuge cascades for further enrichment, to a very low level (less than 300 kilograms). These limitations would extend the time it would take Iran to produce enough weapons-grade HEU for a first nuclear weapon from about two months to about a year. After the limits expire, however, Iran plans to expand its enrichment capacity by a factor of more than 20 in order to produce at least the 27 metric tons per year of 3.7 percent-enriched uranium required to fuel the Russian-supplied Bushehr power reactor. Weapons-grade HEU is typically enriched to a U-235 level of 90 percent or greater. For safeguards purposes, however, the IAEA treats uranium enriched above 20 percent as a direct weapons-usable material. Even 20 percent is a much higher level of enrichment than the less-than-5-percent-enriched uranium that is used to fuel commercial nuclear power reactors worldwide today. The United States, the UK, Russia, and India use HEU for naval fuel, unlike France and, it is believed, China. They should be pressed to shift to low-enriched uranium (LEU) fuel as part of a strengthened global nonproliferation and disarmament regime. Only three countries in the potential Middle Eastern WMD-free zone—Iran, Israel, and Syria—have reactors that use HEU as fuel. These are research reactors, all of which are under IAEA safeguards. Israel’s U.S.-supplied Soreq reactor is scheduled to be shut down in 2018.11The HEU-fueled research reactors in Iran and Syria, supplied by China, contain only about 1 kilogram of HEU each, much less than the 25 kilograms of U-235 that is the figure the IAEA uses as a rough measure of the quantity required for a simple nuclear weapon. China has developed a new fuel for such reactors that could be used to convert them to LEU fuel. Several other research reactors in Middle Eastern states, including the U.S.-supplied Tehran Research Reactor, use fuel enriched to 19.75 percent. Russia and the United States have enough excess HEU to down-blend and use to supply the fuel needs of these reactors and similar reactors worldwide for many decades. Iran already has agreed to import such uranium as other countries do. Iran is the only country in the Middle East with plans for a significant commercial uranium-enrichment program. Israel may now have or might have had a small-scale, centrifuge-based uranium-enrichment capability.12 No other state in the region is believed to have this technology. Saudi Arabia, however, has been unwilling to rule out seeking an enrichment capability. A multinationally managed and operated enrichment plant, bringing together Iran and regional partners, would undercut incentives for Middle Eastern states to follow Iran and build national enrichment facilities. Senior Iranian officials have indicated that Iran is ready to partner with other countries in the region so that they do not have to build their own enrichment plants and to help set up a system to guarantee the fuel supply of nuclear power plants in the Middle East. A strategy of including as partners one or more members of the P5+1, all of whom already hold centrifuge enrichment technology, could maintain extra transparency with regard to Iran’s enrichment operations, uranium acquisitions, and centrifuge manufacture after the extra transparency established under the nuclear deal expires. As a first step, Iran and the P5+1 could establish a working committee on multilateralization of Iran’s enrichment program. They could invite other partners of the region to join and set a five-year deadline to reach agreement. A step toward enabling a Middle Eastern nuclear-weapon-free zone and nuclear disarmament would be for Israel to declare the size of its stocks of unsafeguarded fissile materials. Israel initially need not disclose what portions reside in its nuclear weapons or any other information about its nuclear weapons program and arsenal. Israel would be called on to reduce and eventually eliminate the quantities of plutonium and HEU that it has available for use in weapons by placing increasing portions under international safeguards for verified disposal. Any Middle Eastern nuclear-weapon-free zone will need robust verification. The parties to a zone treaty almost certainly would want a regional monitoring regime to buttress IAEA inspections. Such an arrangement exists in Europe in the form of Euratom. In Latin America’s nuclear-weapon-free zone, Argentina and Brazil have a joint organization, the Brazilian-Argentine Agency for Accounting and Control of Nuclear Materials, through which they monitor each other’s nuclear activities. Measures could go beyond standard IAEA safeguards to include the new transparency obligations accepted by Iran under the July 2015 agreement, such as monitoring of uranium mining and purification, uranium imports, and production of nuclear materials and nuclear-related technology such as centrifuges. Some other elements of a possible verification regime are discussed below. 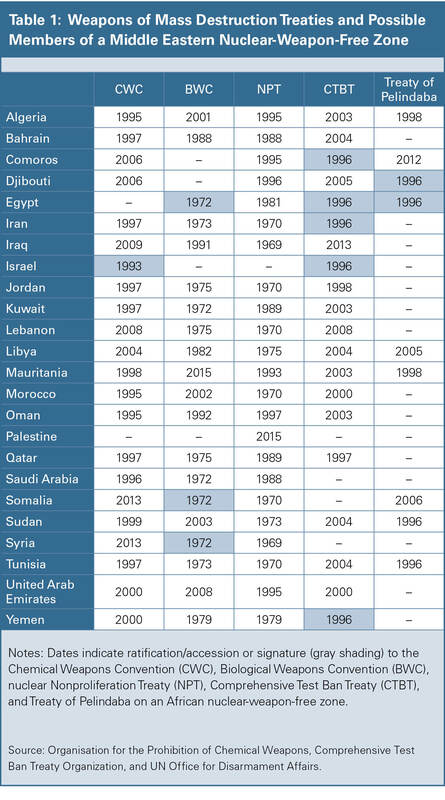 Thirteen of the 23 countries that could be part of a Middle Eastern nuclear-weapon-free zone (Egypt, Iran, Israel, Lebanon, Oman, Palestine, Qatar, Saudi Arabia, Somalia, Sudan, Syria, Tunisia, and Yemen) have not ratified an additional protocol.17 Like Iran, all of these states could bring an additional protocol into force pending ratification. Israel’s safeguards agreement, which has been in force since 1975, covers only the Soreq research reactor. Once this reactor is shut down and the U.S.-origin fuel is returned, no IAEA safeguards of any kind will exist in Israel. As part of the confidence-building process, Israel and the IAEA could negotiate a safeguards agreement that would cover all of Israel’s peaceful nuclear-related activities and fissile material withdrawn from its nuclear weapons stockpile. Israel would not be the first nuclear-armed state to do so. The five NPT nuclear-weapon states and India have signed and ratified additional protocols with the IAEA that are much more limited in coverage than those signed by the NPT non-nuclear-weapon states. Although full transparency and on-site inspections will be indispensable elements of a successful regional and IAEA verification system, some of the initial steps outlined above for moving toward a Middle Eastern nuclear-weapon-free zone could be verified initially with fair confidence without direct access to the sites in question. Among the conditions that could be verified with standoff detection methods could be the shutdown of the reactor and reprocessing plant at Dimona, as described below. Shutdown of the plutonium-production reactor. Satellite or airborne infrared sensors should be able to verify the operational status of Israel’s Dimona plutonium-production reactor by detecting the reduction of the temperatures of the outside of the reactor containment building or the reactor’s cooling towers (fig. 1) once the reactor shuts down. Likewise, the sensors could help detect heat produced by any undeclared reactors in the region. Shutdown of the reprocessing plant. The absence of reprocessing should be verifiable by off-site monitoring for the gaseous fission product krypton-85, which is released when irradiated nuclear fuel is cut open in the first stage of reprocessing. Because the gas is chemically nonreactive, reprocessing plants have not bothered to try to capture it. An analysis of measurements of krypton-85 at a distance of 60 kilometers from Japan’s Tokai pilot reprocessing plant demonstrated a high detection probability.18 Unless Dimona has installed a highly effective capture system, it should be possible to detect, with sensors placed around the Dimona site, any emissions of krypton-85 against the krypton background from reprocessing activities elsewhere in the world (fig. 2). One immediate opportunity for collaborative efforts to build verification capacity could be for Middle Eastern countries to set up a regional data-sharing, analysis, and technical training process focused on existing or planned CTBT monitoring stations. Of special interest could be the radionuclide monitoring stations that look for radioxenon and other isotopes and particles from nuclear explosive tests. There currently are stations in Kuwait City; Misrata, Libya; and Nouakchott, Mauritania. A station is planned for Tehran. Mobile platforms could look for krypton-85 from reprocessing as part of the verification network for a nuclear-weapon-free zone. One particularly important aspect of a verified nuclear-weapon-free zone in the Middle East will be to obtain confidence in the completeness of Israel’s fissile material declaration. This total could be checked after Israel had placed all of its declared fissile material under international safeguards. Israel’s historical production of plutonium could be checked using techniques of “nuclear archaeology.” These would include measurements of isotopic changes of certain trace elements in the permanent metal structures supporting the core of the Dimona reactor.21 The measurements would reveal the cumulative flow, or fluence, of neutrons through the core over the lifetime of the reactor, which would provide the basis for an estimate of the total production of plutonium by the reactor. By committing publicly to this goal in advance, Israel could contribute to a regional confidence-building process and help set the basis for a verifiable Middle Eastern WMD-free zone. The Joint Comprehensive Plan of Action provides an unprecedented opportunity for an international effort to make progress toward a Middle Eastern nuclear-weapon-free zone, possibly as part of WMD-free zone in that region. Building on the foundation created by that agreement, the measures proposed here constitute the essential technical steps toward a nuclear-weapon-free zone. Although it is unlikely that such a zone can be established anytime soon, it should be possible to make progress on a number of the building blocks for it. Region-wide commitments to refrain from separating plutonium for any purpose, to limit uranium enrichment to the levels required for power reactors, and to conduct any enrichment activities only as part of a multinational arrangement would be major achievements. International and regional verification of such commitments would provide enhanced confidence against possible proliferation risks. 1. For a longer discussion, see Frank N. von Hippel et al., “Fissile Material Controls in the Middle East: Steps Toward a Middle East Zone Free of Nuclear Weapons and All Other Weapons of Mass Destruction,” International Panel on Fissile Materials (IPFM), 2013. 2. UN Department for Disarmament Affairs, “Effective and Verifiable Measures Which Would Facilitate the Establishment of a Nuclear-Weapon-Free Zone in the Middle East,” A/45/435, 1991. 3. UN General Assembly, “Letters Received From Member States Confirming Support for Declaring the Middle East a Region Free From Weapons of Mass Destruction, Including Nuclear, Chemical and Biological Weapons: Note by the Secretary-General,” A/68/781, March 6, 2014. 4. For a detailed discussion of various estimates of Israel’s plutonium production, see IPFM, “Global Fissile Material Report 2010; Balancing the Books: Production and Stocks,” December 2010, ch. 8, http://fissilematerials.org/library/gfmr10.pdf. 5. “Plutonium Separation in Nuclear Power Programs: Status, Problems, and Prospects of Civilian Reprocessing Around the World,” IPFM, July 2015. 6. Masafumi Takubo and Frank von Hippel, “Ending Reprocessing in Japan: An Alternative Approach to Managing Japan’s Spent Nuclear Fuel and Separated Plutonium,” IPFM, November 2013. 7. Alexander Glaser, “Characteristics of the Gas Centrifuge for Uranium Enrichment and Their Relevance for Nuclear Weapon Proliferation,” Science and Global Security, Vol. 16, Nos. 1-2 (2008): 1-25. 8. U.S. Nuclear Regulatory Commission (NRC), materials license SNM-2010 issued for the Louisiana Energy Services National Enrichment Facility near Eunice, New Mexico, June 23, 2006, http://pbadupws.nrc.gov/docs/ML0617/ML061780384.pdf. 9. Areva, “Expanding the U.S. Nuclear Infrastructure by Building a New Uranium Enrichment Facility” (presentation at pre-application meeting with the NRC, May 21, 2007), http://pbadupws.nrc.gov/docs/ML0716/ML071650116.pdf. 10. The deputy head of the Iranian navy said in 2012, “Since we possess peaceful nuclear technology, therefore we can also put on our agenda the construction of propulsion systems for nuclear submarines.” “Iran Plans to Build N-Fueled Submarines,” PressTV, June 12, 2012. 11. Shlomo Cesana, “Israel’s Soreq Nuclear Reactor to Shut Down in 2018,” Israel Hayom, March 21, 2012. 12. IPFM, “Global Fissile Material Report 2010,” p. 115. 13. Mohamed ElBaradei, “Towards a Safer World,” Economist, October 16, 2003; Alexander Glaser, Zia Mian, and Frank von Hippel, “After the Iran Deal: Multinational Enrichment,” Science, June 19, 2015. 14. The centrifuges used in Urenco plants, including the Urenco USA plant, and in Areva’s plant in France are made on a “black-box” basis by the Enrichment Technology Company, which is jointly owned by Urenco and Areva. 15. Israel is believed to have clandestinely obtained about 300 kilograms of weapons-grade uranium from a U.S. naval fuel fabrication facility during the 1960s. Victor Gilinsky and Roger J. Mattson, “Did Israel Steal Bomb-Grade Uranium From the United States?” Bulletin of the Atomic Scientists, April 2014. See also Victor Gilinsky and Roger J. Mattson, “Revisiting the NUMEC Affair,” Bulletin of the Atomic Scientists, Vol. 66, No. 2 (March 2010). 16 . International Atomic Energy Agency (IAEA), “Model Protocol Additional to the Agreement(s) Between State(s) and the International Atomic Energy Agency for the Application of Safeguards,” INFCIRC/540 (Corrected), December 1998. 17. 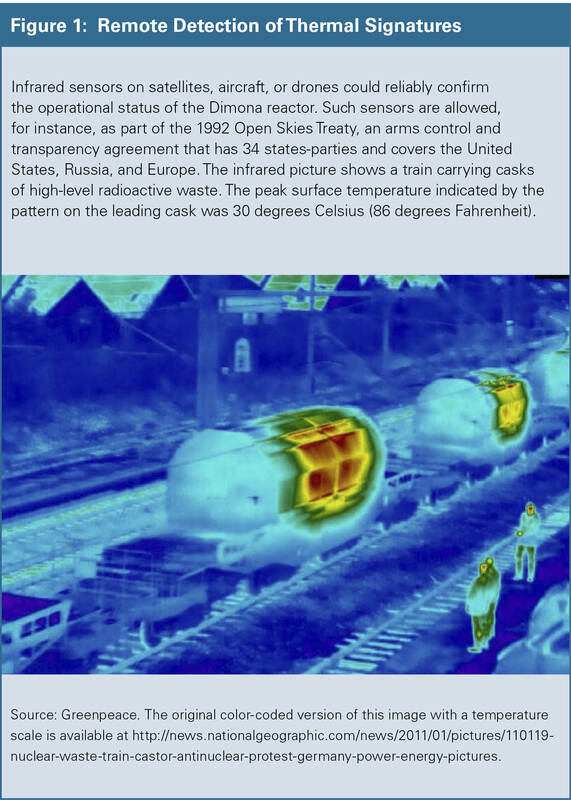 IAEA, “Status of the Additional Protocol; Status as of 03 July 2015,” November 13, 2015, https://www.iaea.org/safeguards/safeguards-legal-framework/additional-protocol/status-of-additional-protocol. 18. R. Scott Kemp, “A Performance Estimate for the Detection of Undeclared Nuclear-Fuel Reprocessing by Atmospheric 85Kr,” Journal of Environmental Radioactivity, Vol. 99, No. 8 (August 2008): 1341-1348. 19. R. Scott Kemp and Clemens Schlusser, “Initial Analysis of the Detectability of UO2F2 Aerosols Produced by UF6 Released From Uranium Conversion Plants,” Science and Global Security, Vol. 16, No. 3 (2008): 115-125; R. Scott Kemp, “Source Terms for Routine UF6 Emissions,” Science and Global Security, Vol. 18, No. 2 (2010): 119-125. 20. Such a cradle-to-grave approach was proposed by Austria in 2009. IAEA “Communication Dated 26 May 2009 Received From the Permanent Mission of Austria to the Agency Enclosing a Working Paper Regarding Multilateralisation of the Nuclear Fuel Cycle,” INFCIRC/755, June 2, 2009. 21. Alex Gasner and Alexander Glaser, “Nuclear Archaeology for Heavy-Water-Moderated Plutonium Production Reactors,” Science and Global Security, Vol. 19, No. 3 (2011): 223-233. Alexander Glaser, Zia Mian, Seyed Hossein Mousavian, and Frank von Hippel are members of the Program on Science and Global Security at Princeton University. Mian is a member of the Arms Control Association Board of Directors. Iran and six world powers formally adopted their July 14 nuclear deal last month and began taking steps to implement the agreement. Iran and the six-country group known as the P5+1 formally adopted their July 14 nuclear deal last month and began taking steps to implement their respective commitments. The agreement specified that formal adoption was to take place 90 days after the UN Security Council passed a resolution endorsing the deal, which the council did on July 20. The 90-day adoption period allowed countries to review the deal internally. The United States completed its congressional review process on Sept. 17 (see ACT, October 2015), and Iran’s parliament passed a bill approving the deal on Oct. 13. Iranian Supreme Leader Ali Khamenei endorsed the deal on Oct. 21, but said that any new sanctions on Iran would jeopardize Tehran’s participation. After the Oct. 18 formal adoption, Iran began taking steps to restrict its nuclear program while the P5+1 (China, France, Germany, Russia, the United Kingdom, and the United States) took initial steps to provide Iran with relief from nuclear-related sanctions. In an Oct. 18 statement marking the adoption of the deal, U.S. President Barack Obama called the day “an important milestone toward preventing Iran from obtaining a nuclear weapon” and said he had directed the government to begin preparations to provide relief from the sanctions. The European Union also issued a statement on Oct. 18 noting that it adopted the legislative framework to lift its nuclear-related sanctions on the deal’s Implementation Day. Under the terms of the deal, Implementation Day is to occur when the International Atomic Energy Agency (IAEA) certifies that Iran has taken certain steps to restrict its nuclear program and put in place increased monitoring. That determination brings U.S. waivers into effect and triggers the lifting of EU and UN sanctions. Ali Akbar Salehi, head of the Atomic Energy Organization of Iran (AEOI), told reporters on Oct. 17 that the exact timing of Implementation Day is unknown at this point but that Iran can complete its commitments by the end of the year. Richard Nephew, a former State Department official who was part of the team that negotiated with Iran, said in an Oct. 19 e-mail that he thinks “the careful removal, decontamination and storage” of Iran’s excess centrifuges will be the most difficult task. Iran currently has more than 19,000 centrifuges installed at two facilities, Natanz and Fordow, of which about 10,200 are currently enriching uranium to reactor-grade levels, or about 3.67 percent uranium-235, according to Iran and the IAEA. Under the deal, Iran must cut its number of centrifuges to 6,104, of which 5,060 will enrich uranium to reactor-grade levels for the first 10 years of the deal at the Natanz site. The remaining 1,044 machines will be at Fordow, which is to be repurposed for isotope research. On the question of the time that will be required to complete the removal and storage of the centrifuges, Nephew, now at Columbia University, said that he cannot conceive “of a careful effort that takes less than four months,” given the “physical dimensions of the spaces” where the centrifuges are installed, the size and sensitivity of the machines, and the number that must be removed. He said it is possible to do the job more quickly “but that will require reckless maneuvers with the centrifuges” that would be surprising for the AEOI. 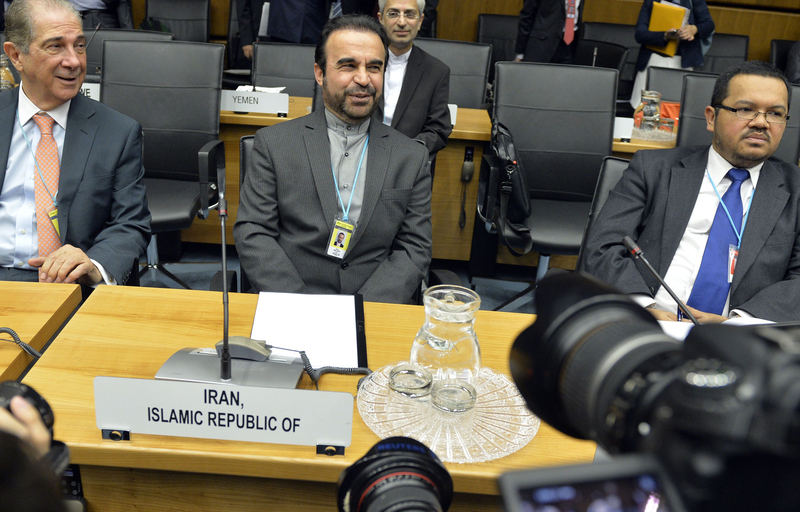 The AEOI oversees Iran’s nuclear facilities and will be responsible for implementing many of the steps under the deal. Iranian Deputy Foreign Minister Abbas Araqchi said on Oct. 19 that Iran would begin removing centrifuges when President Hassan Rouhani issued an order to the AEOI to implement its nuclear commitments. Araqchi also said that Iran, the United States, and China worked together on a plan for the modernization of the Arak reactor. Under the terms of the deal, the core of the unfinished reactor must be removed and destroyed before Iran receives any sanctions relief. The reactor will be modified to produce much smaller amounts of plutonium in its spent fuel. If the reactor had been completed as designed, it would have been able to produce enough plutonium for about two weapons a year. Chinese officials have said they will work with Iran at the Arak site to modify the reactor. Araqchi spoke to reporters in Vienna after the first meeting of the joint commission set up by the nuclear deal to oversee the accord’s implementation and resolve any disputes between the parties. In a press briefing two days before the Oct. 19 meeting, a senior U.S. official said setting up the working groups for the commission was on the meeting agenda. The text of the deal calls for the joint commission to set up several working groups, including ones to monitor the modification of the Arak reactor and Iran’s procurement of any materials and equipment that could be used for its nuclear program. The United States was represented at the meeting by Thomas Shannon, State Department counselor, and Stephen Mull, a former ambassador to Poland. Mull was appointed lead coordinator for Iran nuclear implementation on Sept. 17 by Secretary of State John Kerry. The IAEA announced on Oct. 15 that Iran had complied with its obligations under a separate July 14 agreement between Tehran and the agency, which laid out a schedule for completing the IAEA’s investigation of Tehran’s past activities allegedly related to developing a nuclear weapon. The agency’s Oct. 15 statement said that all of the activities specified in its agreement with Iran were completed on schedule and that the IAEA would provide its board of governors by Dec. 15 with a report assessing Iran’s past activities. According to the agreement with the P5+1, Tehran needed to comply with the IAEA probe before the deal could be formally adopted. In an Oct. 19 speech in Tehran, Ali Larijani, the speaker of the Iranian parliament, called on the IAEA to respect the confidentiality of its communications with Iran. Larijani said that if the IAEA reveals Iran’s “secrets,” then Tehran will “change the quality” of its cooperation with the agency. Iran tested a new ballistic missile last month, apparently violating a UN Security Council resolution prohibiting such launches. State Department spokesman Mark Toner said in an Oct. 13 press briefing that the test “appears to violate” a 2010 UN Security Council resolution and that the United States would raise the issue at the Security Council, which it did on Oct. 21. Under Resolution 1929, Iran “shall not undertake any activity related to ballistic missiles capable of delivering nuclear weapons.” Nuclear-capable ballistic missiles are generally understood to be missiles capable of carrying a 500-kilogram payload over a distance of 300 kilometers. 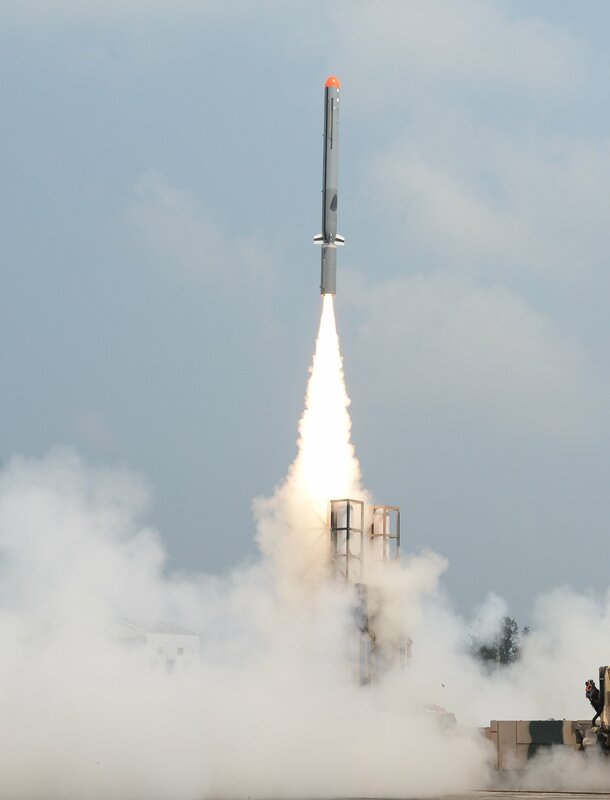 The Emad, the missile that Iran launched, is a liquid-fueled, medium-range ballistic missile that is estimated to carry a 750-kilogram payload and has a range of 1,700 kilometers. It is a more precise variant of the Shahab-3 ballistic missile that Iran first deployed in 2003. In a 2013 report, a panel of experts set up by the Security Council to monitor compliance with sanctions on Iran found that Tehran had violated the resolution by testing nuclear-capable ballistic missiles. Iranian officials have said they do not consider themselves obligated to follow the restrictions in Resolution 1929, which they view as illegal and based on manufactured evidence that Tehran was developing nuclear weapons. Resolution 1929 was put in place to continue pressuring Iran to negotiate a resolution to the controversy over its nuclear program. Under the nuclear deal reached between Iran and six world powers (China, France, Germany, Russia, the United Kingdom, and the United States) on July 14, Resolution 1929 and other Security Council resolutions calling on Iran to limit its nuclear program will be replaced by Resolution 2231. The Security Council unanimously passed Resolution 2231, which endorses the July 14 nuclear deal, on July 20. It will come into effect when the International Atomic Energy Agency certifies that Iran has taken key steps to limit its nuclear program and put in place greater transparency measures. Resolution 2231 calls on Iran not to develop or test ballistic missiles that are “designed to be capable” of delivering nuclear warheads. The July 14 nuclear deal does not restrict Iran’s ballistic missile program.